Boeing Co.’s 737 Max crisis has been largely self-inflicted, but now it’s passing some of consequences onto its suppliers. A crash of an Ethiopian Airlines-manned Max in March — just five months after a Lion Air jet of the same type went down — has put the plane maker at the centre of a political, legal and increasingly financial firestorm where its reputation for safety is being openly questioned. A fix for a flight-control system that’s believed to have been a factor in both accidents is taking longer than expected amid the scrutiny ... and Boeing can’t deliver the planes without it. And so, the company announced that it will curtail production of the Max to 42 planes per month, down from a current rate of 52. 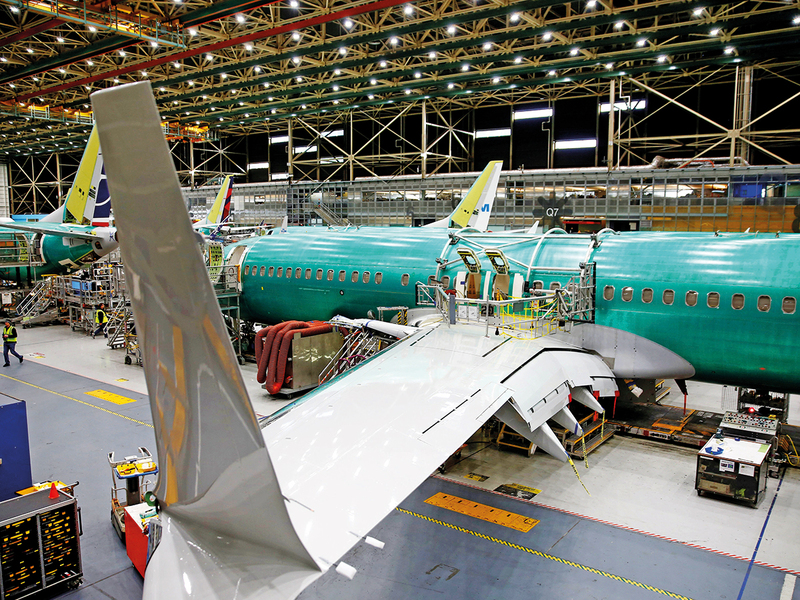 Before all this, Boeing had planned to ramp up production of the Max to 57 a month, an aggressive goal that suppliers had been preparing for by hiring more employees and expanding capacity. Boeing plans to work with suppliers to blunt the financial impact from this shift. Spirit AeroSystems Holdings Inc. and CFM International, the joint engine venture of General Electric Co. and Safran SA, both said they intend to maintain their current pace of production. But it’s unclear what Boeing will do with that inventory. The longer the grounding lasts, the more unlikely it is that suppliers will emerge from this debacle unscathed. They risk losing revenue from lower demand and cash flow hits should their investments go unneeded. Legal complaints are mounting, with consumer advocate Ralph Nader urging a recall of the Max on behalf of his grand-niece who died in the Ethiopian Airlines crash. That may not go far, but meanwhile, Ethiopian Airlines said that it was rethinking plans to purchase an additional 25 Max jets because of the “stigma” associated with the plane. PT Garuda Indonesia had already initiated steps to cancel a $4.8 billion order because its customers don’t trust the plane. Investigators said that pilots on the Ethiopian Airlines flight attempted to follow procedures to disable the flight-control system that Boeing had laid out after the Lion Air crash. The pilots were unable to regain control, suggesting the procedure wasn’t as simple as Boeing made it seem and undercutting its previous attempts to deflect blame away from itself as it insisted the plane was airworthy. The investigators’ report appears to have been a rude awakening for Boeing, which has at times come off as tone-deaf in its response to the crashes and seeming resistance to the implication that its design or processes were flawed. Boeing CEO Dennis Muilenburg made a halfway attempt at accountability in a video, apologising for the pain the accidents have caused, while at the same time characterising the crashes as the result of a “chain of events”. He stopped short of saying Boeing’s initial recommendations were insufficient, acknowledging only that erroneous activation of the software “can add to what is already a high workload environment”. Regardless, it’s on Boeing to fix the software and that’s proving to be complicated. The company said that it would be several more weeks before it could submit the software update to the Federal Aviation Administration for approval. That’s a bit awkward as Boeing had hosted a junket to sell the fix to pilots and journalists and said it would have the final paperwork to the FAA by March 29. Obviously, Boeing should be sure it has all the kinks worked out this time. The company reportedly discovered a problem with integrating the fix with existing flight-control infrastructure in the final audit and unearthed an unrelated software issue. But this underscores the fact that this is a process that can’t be rushed, especially as international regulators feel compelled to piggyback on the FAA with safety reviews of their own amid uncomfortable questions about whether the organisation was too cosy with Boeing to catch and prevent these problems ahead of time.